The first place to start your search for a reputable contractor can be to ask friends and family members whom they have used for similar projects. If they had a good experience, most people would be happy to refer their remodeling contractor. Professional organizations are also a good source for finding quality contractors. One such organization is the Homebuilders Association of Middle Tennessee, which is a subchapter of the National Home Builder Association. You can phone them at (615) 366-7185 and request a list of contractors that belong to the Remodelers’ Council. 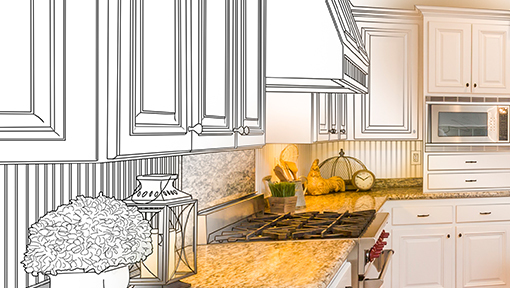 Another excellent organization to contact is the National Kitchen and Bath Association (NKBA) at 1-800-843-6522, and you can request a list of members in the middle Tennessee region. These organizations as well as the local Better Business Bureau should be helpful to begin the search process for the right remodeling contractor. Verify that the contractor is registered by asking for his or her state contractor’s license. You can reach the State of Tennessee Contractors License Bureau at 1-800-544-7693 or online at tn.gov. In addition to the license, you should also get copies of the insurance policies, including liability, workers compensation, and property coverage. If your contractor is not licensed or properly insured, you are putting yourself at risk. Sometimes, contractors offer to show you kitchens and baths of former clients where they may have used similar materials as proposed for your project. This job visit is very useful as it allows you to not only to observe and compare materials but also evaluate their workmanship. It also allows you to discuss with the contractor’s former client their remodeling experiences (e.g. contractor’s work record, care of client’s property, remodeling expectations against the final remodeling results, etc.). The personal visit provides you an excellent reference on the contractor. If this is not possible, however, phone calls to several of the contractor’s former clients may suffice. Reputable contractors will be pleased to provide you the information so you can make an informed decision. Generally, most people are not aware of the tasks or material costs involved in remodeling a kitchen or bathroom area. They usually start by calling several contractors, getting at least three ballpark estimates and comparing the bottom lines for the remodeling project. Because nothing has been selected or written down, each contractor makes certain assumptions about the project and comparing each estimate at this stage is like comparing apples and oranges. The project has to be defined with a detailed needs assessment, a design and all the materials need to be selected in order to initiate a comprehensive proposal. Only with a written detailed proposal that includes the same work tasks and materials can comparisons of proposals be made. Require each contractor to be specific with his or her written bids, listing all the tasks to be performed as well as the materials with a complete description including color, model numbers, etc. to be used. Another important factor is the respect factor between you and your contractor. This is not necessarily a personality contest; however, you must feel comfortable and have respect for the contractor as well as he for you. It is a mutual blessing for both of you; he needs the work and you need it done professionally. Your association must be a win-win for all concerned.